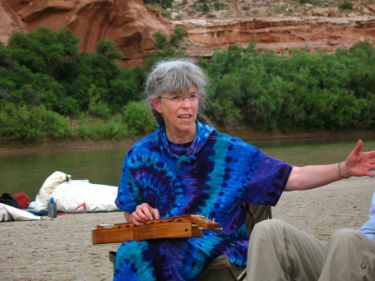 For more than twenty summers we’ve gathered all sorts of musical instruments and gone on a river trip. It's all the wonder of river running, desert strolling and warm riverside camping in combination with music in starlit sand amphitheaters. It's the camaraderie of a music camp and a river trip all rolled into one! 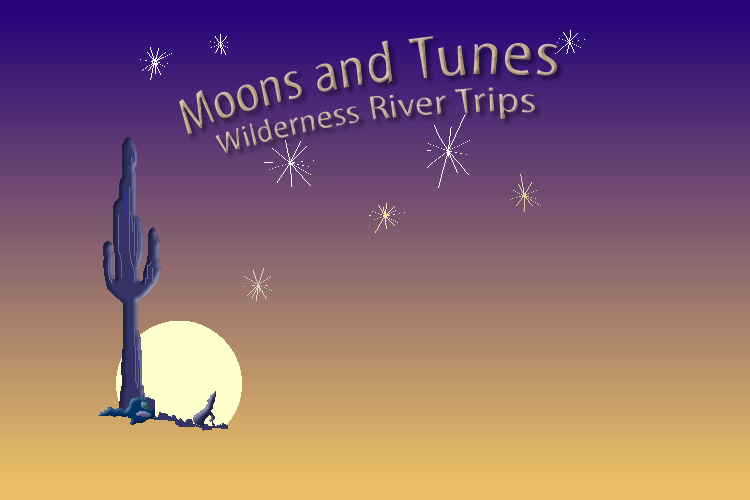 Bring any sorts of instruments (dulcimers, guitars, oboes and ocarinas), your camping get up, your smiles and your friends and we'll bring professional guides, rafts, fabulous food and whatever other specialized equipment you might need on the river. No river experience is necessary. We'll teach you everything you need to know about camping and river traveling. Here's a photo by Carlye Calvin. Also a Carlye Calvin photo. 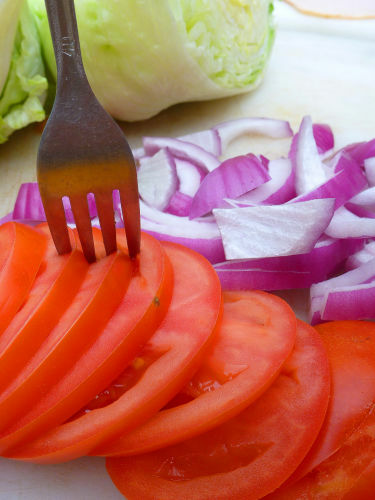 Our guides will cook things like this for us to eat! Here's what we have planned for 2019? 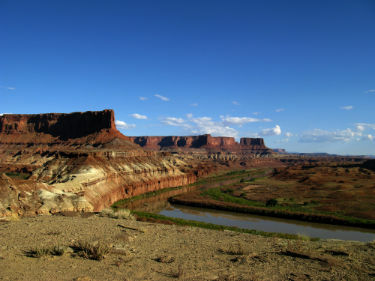 We’ll camp the night before the put in, and the night after we take out at Green River State park in Green River, UT, meeting around 5 the evening before for orientation and to meet our river guides. The next morning early (like 7 or 8) we'll drive over to the river company headquarters where we'll leave our cars while we're on the river. Then the river company will drive us to the small local airport and we'll have a 45 minute ride in small planes to the put in. Five days later we take out less than an hour’s drive from Green River with blissful smiles all around. Thinking about logistics of plane reservations and general travel scheduling, it's a good idea not to plan to get off the river in the late afternoon and then have to drive a long ways to get to plane reservations or home that night - tired people are much more prone to accidents, and we never know exactly when we will get off the river. And in the fun at the end of trips department, we frequently treat our guides to dinner at the local boatman's hangout in Green river on the takeout night. It's a really nice way of saying good bye after our very intense time together. Endings of events are one of the most important elements of any activity - parties where no one wants them to end are always sweet. No need to rush these moments - so we have booked the group camp at Green River State Park for the night of the takeout if you wish to join us. Desolation and Grey Canyons sport some of the best western outlaw history in the Colorado Plateau. We’ll have to read up on the Hole in the Wall Gang, maybe even watch Butch Cassidy and the Sundance Kid to get some idea of portions of that history. Another unique feature is the plane ride over the river to the put in - we'll fly over the stretch of river we'll float for the next few days. Quite exotic if you like that sort of thing. *really delicious meals (all cooked by the guides) and eating utensils from lunch on Wednesday till lunch on Sunday. *all the specialized river gear - boats, life jackets, kitchen, etc. Please send it as soon as you decide you will come or April 1st at the latest. Those of you who have come before know that the trips fill quickly as soon as I announce them, although there is sometimes a later spot or two if someone has to cancel. So send me that check as soon as you make up your mind which trip you’d like to join. You bring your own general camping gear - tent, sleeping bag, sleeping pad (can be rented from the river company if you don't have these) and whatever clothes you need to be comfortable in all conditions in the wilderness for 5 days. Our costs are quite a bit below the "catalog price" for this trip and they cover more of your expenses - pre and post trip camping, guide tips, and incidental expenses. We get this discount because I do the organization work and because there are enough of you to fill the trips. That said, please contact me first with any questions you may have; if I can't answer them sufficiently, we'll check with the river company. The idea is that we bring them a full trip without too much pre-trip work for our esteemed company. We’re planning to have smaller trips this year - around 20 people per trip. As those of you who come often know, these trips generally fill quickly, so best to send your check as soon as you decide, and before April 1 at the latest. Please get in touch with me if you have any questions: Bonnie@BonnieCarol.com, 303 258-7763. I love to talk about our trips. I can't tell you what will happen on this summer's trip any better than to describe other year's trips, and let you use your imagination. Each trip is different, and all have been some the best experiences of my life. First, there's the river and canyons, the dories and duckies, wildlife, breezes, weather, naps, white sand beaches, swimming, and stars. Then there's the human-type fun our little week-long community creates - music, dances, poetry, skits, etc. - as we get to know one another. On past trips, we've created dances on the spot (or rather on the sand, I guess would be a better description) from Sufi to step dance; we've had dulcimer playing zebras; there was lover's waltz dedicated to two couples who joined us for their anniversaries; we had an evening of love songs, which included a poem from the great Western cowboy poetry tradition about the unbridled love between a cowboy and his horse; Kokopelli made a guest appearance to play a duet with our saxophone player for a lunch concert/dance; we had a performance of stand-up comedy improv about nights in New York; costume parties have featured characters from Grace Slick of the Jefferson Airplane to the Pope - whatever one can create from the contents of a dry bag and the treasures to be found on the river bank; we celebrated Max's 60th birthday on one trip and many people dressed up as Max - hard to determine the real Max that year; some years we have very active photo contingents, and sometimes there's a yoga or tai chi flavor. Anything can happen when a bunch of fun-loving creative people get together for a week, depending on what you bring along! If you're a person who likes photos instead of words, try http://bonniecarol.com/RiverDul99pics.html for some goodies of what fun we've had on these trips. Please bring yours - not anything extremely valuable or irreplaceable (not that we’ve ever lost an instrument, but outdoor environments are hard on instruments - heat, cold, sand, dry, humid.) The instruments ride in waterproof bags on the boats and the guides are quite careful in packing them. Flutes, saxophones, guitars, dulcimers, hammered dulcimers, ukuleles, banjos, mandolins, penny whistles, recorders, and even accordions have all joined us at one time or another. Guitars and other fragile instruments need hard cases. I have two pretty good guitars and a 12/11 Masterworks hammered dulcimer that all are welcome to share. What else would you like to know to make a decision? Please feel free to ask me. More details about weather, what to bring, etc. will come later. MUST YOU BE A MUSICIAN TO COME? Definitely not. You'll have a fine time participating in all sorts of fun, creativity, and silliness of our own making. MUST YOU BE AN EXPERIENCED OUTDOORS PERSON TO COME? Definitely not. Previous river or camping experience is not necessary - we'll show you everything you need to know to have a fine time. If you don't have your own tent and sleeping gear, it can be rented. So speak to your friends and relatives, collect the people you'd like to be with, and all of you come join in the annual trip of a lifetime! "You’ve got to go - that’s the main thing. I can’t promise you’ll rise before sun up just to see the first light on the canyon walls. I can’t promise you’ll hike further up a side canyon than even your guides have ever been, then slide through a rapid like cream cheese on a bagel. I can’t promise a storm so thick you can’t see the other boats, with hail so hard it hurts and enough water to bring cascades free falling hundreds of feet from the canyon rim to the canyon floor, then fill a wash bank full that hasn’t felt water in years. I can’t promise the sun will break through for a rainbow downstream. I can’t promise you ravens, hawks, herons, eagles, avocets, otters, beaver, deer, big horn, bears, wild horses and mountain lions, or even their tracks. I can’t promise a camp of camaraderie and laughter for a day well spent. 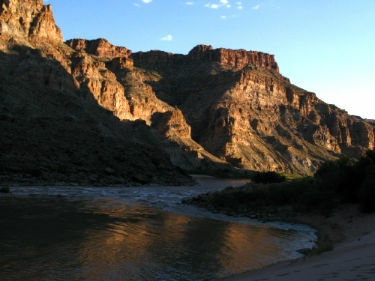 I can’t promise you’ll fall asleep to a chorus of frogs and cicadas under a sky so dark you can see Andromeda, only to awake in a few hours to see the moonlight creep down the sides of the canyon just as the sunlight did so long, long ago.